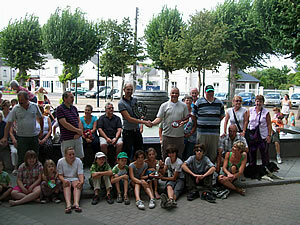 August 2010 saw a new committee take over the Running of "The Wincanton - Gennes/Les Rossier Twinning Association". The bi-annual exchange took place during the first week of August 2010, with Wincanton Twinners travelling to the Loire region of France. A first on this trip was a Fast Ferry Service from Portsmouth to LeHavre, taking only 3 hours 15minutes, instead of the usual six hours. Our hosts in France met us with their usual friendly hospitality. The traditional Petanque contest between the towns started the week of activities, Wincanton giving the French a good run for their money this time, and only losing by a close point in the last game! We had the usual civic reception hosted in "The Marie" and then some spectacular activities were arranged for us. 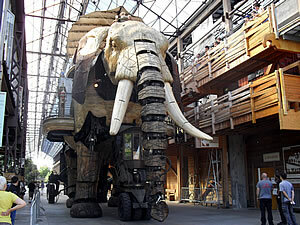 Firstly we visited the city of Nantes, and the Mechanical Elephant, a spectacular Wooden Elephant based on the ideas of fantasy author Jules Verne. Mechanically driven, we boarded the Elephant and took a trip around, viewing the sights of Nantes. We also had a visit to Le Mans and visited the Le Mans 24 Hour Race Car Museum and later in the evening a spectacular illuminated tour of Mediaeval Le Mans. The week ended with a visit to the famous Cointreau Distillery in Angers, where a "few" glasses were sampled! This was followed by a party night at a local restaurant owned by the chairman of the French Association. A football themed evening, with much red, white and blue to be seen. It was then goodbyes and back home to plan for the return visit by the French party to Wincanton in August 2011. 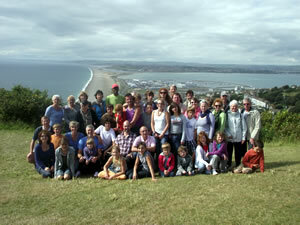 The first week of August 2011 we welcomed a party of 46, including three families of five, to Wincanton. The sun was shining and a week of activities began with the skittle match, won by the French side, and followed by a civic reception hosted by the Mayor Colin Winder. On Tuesday the party spent a day in London, and on Thursday Gary and Elaine Rodgers organized a Mystery Tour of West Dorset, taking in Sherborne, The Cerne Abbas Giant, West Bay, Portland and finishing up with time on the beach and fish and chips in Weymouth. Friday was spent at The Railway Museum in Swindon, and lots of shopping at the retail outlet. This was followed by a party night with a Hawaiian theme and included the challenge of "Welly Wanging" and other party games. The Wincanton - Gennes /Les Rossiers Twinning Association always welcomes new members. If you would like to take part in August 2012, in the return trip to France please contact Mark Reynolds (Chairman) .